The politics of the newly established republic were guided by the Lao People’s Revolutionary Party (LPRP; called the Lao People’s Party until 1972), the communist party of Laos. Its Politburo was dominated by a small cohesive band of revolutionaries who had founded the party in 1955 and had engaged in persistent revolutionary activity until their takeover in 1975. These leaders had a long and intimate relationship with their Vietnamese communist allies. Prior to founding the party, they had been members of the Indochina Communist Party. Most spoke Vietnamese, and some had family ties with Vietnam. The party’s general secretary, Kaysone Phomvihan, had a Vietnamese father; second-ranked Nouhak Phoumsavan and third-ranked Prince Souphanouvong had Vietnamese wives. Their worldview had been shaped by their shared revolutionary struggle with Vietnam. Moreover, the Vietnamese had numerous channels—party, military, and economic—through which they directly conveyed their influence. Thus, the new state was intimately linked to Vietnam and closely followed that country’s policy line until the late 1980s. In the early years of the LPDR, the leadership declared its twin economic goals to be “socialist transformation with socialist construction.” Following the Vietnamese communist model, the party leaders attempted to create agricultural collectives in the countryside and to nationalize the limited industry and commerce in the towns. Former members of the Royal Lao Army and of the deposed government—perhaps as many as 30,000—were incarcerated in “reeducation” camps. These and other repressive political measures and the grim economic conditions in Laos compelled some 10 percent of the country’s population to flee across the Mekong River to Thailand after 1975. As LPRP leaders consolidated their revolutionary victory by the end of the 1970s, they implemented limited policies of economic and social liberalization. In 1986 they inaugurated a major reform called the New Economic Mechanism (NEM), which followed the introduction of perestroika (“restructuring”), a similar economic reform program in the Soviet Union. The NEM introduced market incentives and began decentralizing government economic enterprise. With the collapse of communist regimes in eastern Europe and of the Soviet Union itself in the late 1980s and early ’90s and the implementation of economic reforms under the doi moi (“renovation”) initiative in Vietnam, Laos moved more rapidly to open its economy. Private investment and joint ventures were encouraged, and, to the relief of Lao peasants, attempts at collectivizing agriculture were abandoned in favour of family-operated farms. The ruling party retained unchallenged control, curbing any attempts at organized opposition. Nevertheless, there was some enlargement of political freedom and participation. A new constitution was promulgated in 1991. Citizens were permitted to move about their country more freely and even to cross the Mekong to Thailand with fewer impediments. Kaysone was elevated to heroic status following his death in 1992. Nouhak succeeded Kaysone as paramount leader, serving as president until forced by illness to resign in 1998; Gen. Khamtai Siphandon, a veteran revolutionary and (from 1991) prime minister, then moved from the premiership to the presidency. Although Khamtai oversaw further economic liberalization, he resisted political reforms. The LPRP continued to control the National Assembly, allowing few independents to contest elections. At the same time, the exiled Laotian royal family began to assume a higher profile, calling for a referendum to reestablish the monarchy; though the government generally stifled any dissent and threat to its rule, it took a measured response, particularly because of a growing reverence among ordinary Laotians for the Thai king. By the mid-1990s Laos was experiencing significant economic growth, with per capita GNP rising gradually—if from a very low base. The country had replaced aid from the Soviet Union with more substantial assistance from Japan, western Europe, Australia, and other bilateral donors, as well as from international organizations (including the World Bank and the International Monetary Fund). In addition, neighbouring Thailandbecame by far the largest source of foreign investment. In 1994 a bridge opened between Thailand and Laos across the Mekong River at Vientiane, paving the way for greater trade between the two countries and symbolizing a political realignment for Laos away from its colonial and Cold War ally Vietnam; a second bridge across the Mekong between the two countries, farther downstream, officially opened in 2006. To diversify the economy, which depended heavily on the export of electricity (in addition to financial aid), the government began to open up Laos to visitors by developing tourism. Despite adopting such economic reforms, however, Laos continued to wrestle with underdeveloped fiscal and planning organizations, a weak central bank, and fragile financial institutions. 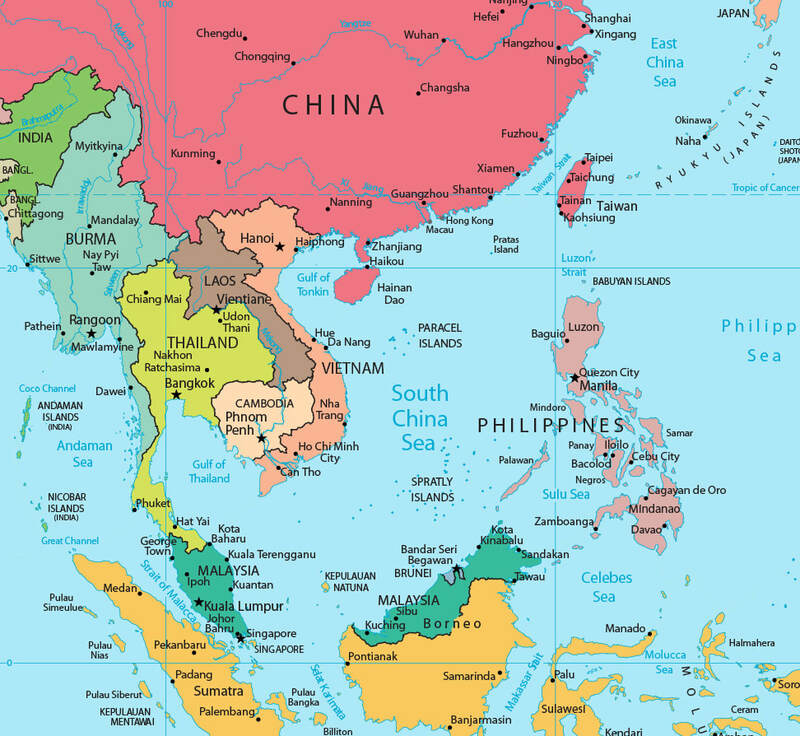 In 1997 the country realized its longtime goal of becoming a full member of ASEAN (Association of Southeast Asian Nations). However, its economy was subsequently damaged by the Asian economic crisis of the late 1990s. The kip (the Lao currency), closely linked to the Thai baht, plummeted in value by more than 75 percent, and inflation soared. Business investment, primarily from Thailand and Malaysia, declined, and Laos’s exports to its neighbours diminished. Although the Thai and Malaysian economies recovered in the early 21st century, Laos’s economic growth remained slow-paced. As the new century advanced, however, the Laotian economy accelerated, benefitting from increased foreign direct investmentfrom a long list of countries (Thailand, Vietnam, Australia, China, France, Japan, Malaysia, South Korea, Singapore, Taiwan, India, and Russia), especially in the natural resource and industry sectors. The largest boost to the economy came from construction of a number of large hydropower dams and expanding mining activities. The impact of these projects was enormous. Without these large hydropower and mining projects, Laos’s GDP growth rate would have averaged nearly two points lower between 2003 and 2006. By 2005 GDP growth in Laos had exceeded 7 percent, a level it would maintain or improve upon for the next decade. Since the beginning of the century, the Laotian government had pursued a modernization of the country’s rural economy through land concessions that brought about the lease of vast areas of cultivable land to foreign investors for the commercial production of crops (notably rubber, sugarcane, cassava, and eucalyptus). Though such concessions officially involved long-term leases of state land to investors, they often covered village lands, owing to poorly defined and enforced regulations governing land rights. Mounting incidents of land disputes between farmers and foreign investors, however, prompted the government to announce moratoriums on new land concessions on more than one occasion during the first two decades of the millennium. The LPRP continued in the early 21st century to rely on leaders who had participated in the revolution prior to 1975, even as the ranks of those senior officials were increasingly depleted by old age and illness. By 2000 most members of the Politburo, largely former military officers, were already over age 70, and, as of the 10th Congress of the LPRP, in January 2016, that largely septuagenarian revolutionary generation continued to hold power, as the ruling party chose Vice Pres. Bounnhang Vorachith, age 78, to replace Choummaly Sayasone, age 79, as general secretary. In April the National Assembly then elected Bounnhang to succeed Choummaly as president and Foreign Minister Thongloun Sisoulith to take over as prime minister from Thongsing Thammavong. Choummaly had served as general secretary and president since 2006, and Thongsing had been prime minister since 2010. Laos’s foreign policy has undergone significant alteration since the collapse of the Soviet Union and of communist regimes in eastern Europe, but important continuities remained. The government retained its official commitment to Marxism and Leninism and expressed fraternity with its two communist neighbours, Vietnam and China, both of which continued to exert substantial political and economic influence on Laos. At the same time, Laos expanded its economic reliance on the industrialized West and on Japan and continued its formal association with the Francophone community of countries. However, the number of Laotians who speak French has been diminishing rapidly as the older generation—whose elite were educated in French—passes from the scene and English becomes the country’s second language. Many in the old guard of the LPRP and National Assembly continued to support closer relations with Vietnam while younger members steered more toward China, and proponents of greater economic and political reform looked toward Thailand and the West. ​Khmer Rouge, ( French: “Red Khmer”) also called Khmers Rouges, radical communist movement that ruled Cambodia from 1975 to 1979 after winning power through a guerrilla war. It was purportedly set up in 1967 as the armed wing of the Communist Party of Kampuchea. The Khmer Rouge government was overthrown in 1979 by invading Vietnamese troops, who installed a puppet government propped up by Vietnamese aid and expertise. The Khmer Rouge retreated to remote areas and resumed guerrilla warfare, this time operating from bases near the border with Thailand and obtaining aid from China. In 1982 they formed a fragile coalition (under the nominalleadership of Sihanouk) with two noncommunist Khmer groups opposed to the Vietnamese-backed central government. The Khmer Rouge was the strongest partner in this coalition, which carried on guerrilla warfare until 1991. The Khmer Rouge opposed the United Nations-sponsored peace settlement of 1991 and the multiparty elections in 1993, and they continued guerrilla warfare against the noncommunist coalition government formed after those elections. Talks aimed at bringing the Khmer Rouge’s surviving leaders to trial began almost immediately after the movement’s demise. After years of wrangling and delay, the Extraordinary Chambers in the Courts of Cambodia (commonly called the Khmer Rouge Tribunal) was established in 2006 as a joint operation between the United Nations and the government of Cambodia. The first indictments were handed down in 2007, and the first trial—against Kaing Guek Eav (better known as Duch), the former commander of a notorious Khmer Rouge prison—got under way in 2009. In 2010 Duch was convicted of war crimes and of crimes against humanity and was sentenced to prison. Ieng Sary, who had also been indicted in 2007, died in detention in 2013 while being prosecuted for crimes against humanity.